There are a lot of stories about Monticello that crept into the lore over the years – mostly after Jefferson died, after all the family had left Monticello, and no one who had lived there during its heyday was around anymore to refute them. These stories found their way into popular literature and are still coming back home to roost, so to speak, in the form of queries from visitors. One of the most persistent of these stories is one about Jefferson using the Dome Room as a billiard hall. The west front the rooms occupy the whole height, making the house one story, except the parlor or central room, which is surmounted by an octagonal story, with a dome or spherical roof. This was designed for a billiard-room; but, before completion, a law was passed prohibiting public and private billiard-tables in the State. 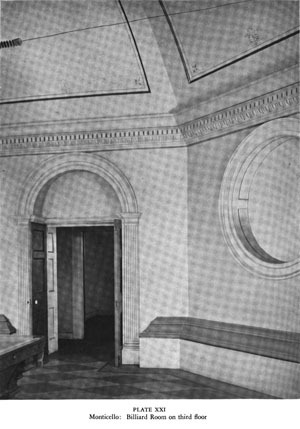 It was to have been approached by stairways connected with a gallery at the inner extremity of the hall, which itself forms the communication between the lodging-rooms on either side above. The use designed for the room being prohibited, these stairways were never erected, leaving in this respect a great deficiency in the house. This is a rather well-developed and fascinating piece of family lore, and I would love to know how it came into being. Needless to say, we have no reason whatsoever (other than this story) to believe that Thomas Jefferson originally intended the Dome Room for billiards, or that he actually employed it as such. If I’m not mistaken, that’s a billiard table. In the Dome Room. On the third floor is the famous ballroom, built originally for billiards of which Jefferson was extremely fond. Scarcely was it completed, however, when he discovered, to his chagrin, that the game was prohibited by a law recently passed by the State Legislature. The story runs that some years earlier there lived within the borders of Virginia a very brilliant and promising young lawyer named John Marshall, who insisted on wasting his time on games of all sorts, and most especially on billiards. In vain his friends urged him to work seriously and give up such unprofitable pastimes. Marshall was not to be moved. Finally some one suggested that a law should be enacted to suppress billiards, declaring that “Marshall would never break a law.” The State Legislature, at the time, was composed largely of the young man’s friends, and they passed the necessary bill. They laughingly used to say, afterwards, that Marshall owed to their timely intervention his subsequent brilliant career, which made him chief justice of the United States Supreme Court. However, the fact remains that billiards were prohibited throughout Virginia; and Jefferson, with the calm philosophy that characterized so much of his life, made the best of a bad bargain, and the room was converted into a ballroom, perhaps the most famous in any private residence of the time. Could its walls speak, they would tell strange tales of the beauty, gallantry, and wit that once assembled there. It was to have been approached by stairways connected with a gallery at the inner extremity of the hall. For some unknown reason these were never erected; instead, a staircase was built in each wing, of such narrow dimensions that it is still a problem how the grand ladies with their ample hoopskirts ever ascended to the ballroom above. I started to try to pick apart all the errors, distortions, and outright fantasies in Maud’s description of the Dome Room, but then I got tired. Let’s just say, the only thing she’s right about is that the Dome Room is on the third floor. In Maud’s defense, there was a billiard table right there in the Dome Room, at least in 1898. You know and I know that that doesn’t mean there was one there in 1815, but Maud seems an easily suggestible lady. Bless her heart. The billiard table was apparently still in the Dome Room at least into the late 1920s, years after the Thomas Jefferson Foundation had opened Monticello’s doors to the public. This no doubt helped to keep the myth going. Here’s an image, taken ca. 1928, from I.T. Frary’s Thomas Jefferson: Architect and Builder (Richmond: Garrett and Massie, 1931), in which the corner of the (presumably) very same billiard table is clearly visible. And, the author actually calls it “the Billiard Room” right there, in the caption! No wonder people thought the Dome Room was a billiard room, what with all this calling it a “billiard room” and having billiard tables in it. Regarding Maud’s Ballroom Fantasy, well…if there were any glittering balls held up there, then all the guests of these balls must have been sworn to silence, because I’m unaware of anyone ever mentioning attending such a thing in any letters, diaries, or memoirs. The truth is that we simply don’t have good evidence for any specific intended function for the Dome Room. But Nature abhors a vacuum, and so do inquiring minds. In the absence of any clear explanation for the Dome Room’s existence, it’s no wonder that more interesting stories creep in to fill the space. Great bit of history trivia !! Wonderful story ! It is a great story, the great John Marshall piddling his time away!